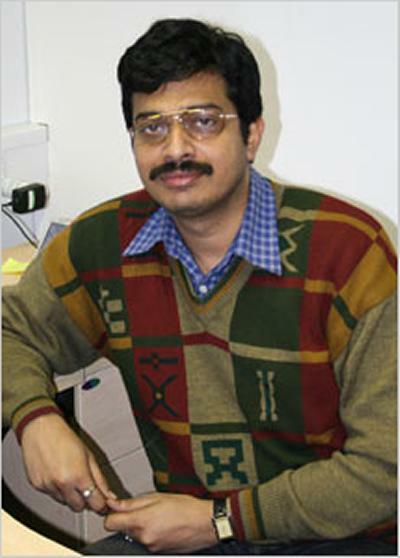 Professor Koushik Maharatna is part of the Institute for Life Sciences at the University of Southampton. Prof. Koushik Maharatna received his B.Sc. in Physics and M.Sc. in Electronic Science (Semiconductor science and technology) from Calcutta University, Calcutta, India in 1993 and 1995 respectively. From 1996 till 2000 he was involved as a key member in a number of Indian Govt.-funded projects such as Design and Development of Gate Arrays, development of a low-cost Doppler Ultrasonography system and designing a regenerative transponder based satellite system. All these projects were undertaken at Indian Institute of Technology (IIT), Kharagpur, India. He received his Ph.D. degree from Jadavpur University, Calcutta, India, in 2002 for his thesis, “CORDIC-based signal processors for biomedical applications”. In February 2000 he joined the Institute for High-Performance Microelectronics (IHP), Frankfurt (Oder), Germany as a Research Scientist where he was involved in the BMBF-funded projects “Wireless Broadband Networks” (WBN) and IBMS2, both of these projects targeted low-cost low-power implementations of the IEEE 802.11a and Hyperlan/2 standards. He took the leadership in integrating the entire system which is now functional. At the same time he was appointed as the Project Leader for the project “Design and development of high-performance Analogue to Digital Converter”; which was a collaborative effort between IHP and IIT (Kharagpur). As the project leader his job was to allocate manpower, funding and to coordinate between research activities in IHP and IIT. His work in IHP resulted into four patents and several research publications in prestigious IEEE journals and conferences. He achieved the status of A-grade scientist; the topmost achievable scientific grade in IHP. In August 2003, Dr. Maharatna was appointed as a Lecturer in the Dept. of Electrical and Electronics Engineering (EE), University of Bristol, UK. He developed a VLSI research infrastructure and research team in Bristol and collaborated with the Toshiba Research Lab in Bristol to initiate a visionary research in the field of Analogue Signal Processing. He also played an instrumental role in establishing a research link between Bristol and IHP. At the same time he acted as the key person to form a group in Bio-inspired circuit design for implantable therapeutics: a vision; which included doctors, chemists, physicists and engineers. He also acted as the EE representative to the design advisory committee for the multidisciplinary course Engineering Design. He was also appointed as the leader from the EE (along with his counterpart form dept. of Computer Science) for a specialised IC design M.Sc. course initiated by UK semiconductor industry (like ICERA, STMicorelectronics, Motorola etc.) and University of Bristol in 2005. In October 2006, he joined the Electronics Systems Design (ESD) group of School of Electronics and Computer Science (ECS), University of Southampton as a Senior Lecturer. At present he is a Professor in Signal Processing Systems Design in ECS and belongs to the Electronics and Software Systems (ESS) group. He is currently pursuing his research vision for next-generation mobile healthcare system development and bio-inspired nano-scale circuits design while at the same time successfully maintaining/establishing his existing/growing research collaborations both in industry and academia around Europe and USA. As pioneering research in next-generation mobile healthcare system development, Prof. Maharatna is acting as the Principal Investigator from Southampton for the ARTEMIS-JU funded collaborative project CHIRON that includes 27 parneters all over the Europe. He is also the UK coordinator of the project. As part of the project his team is developing sophisticated and yet low-complexity signal processing algorithms and VLSI architectures for on-body clinical feature extraction from wearable ECG in mobile environment. He is pioneering the research in treating Autistic children through development of brain connectivity-guided neurofeedback system employing pervasive EEG capturing device and analysing the EEG pattern through advanced signal processing techniques. This project is (MICHELANGELO) is recently funded by the EU FP7 programme. The ultimate aim is to develop a home-based system that will allow intensive intervention in Autistic children in pervasive way. In addition, he is also leading a tem for developing a novel and wearable Stroke rehabilitation system that is expected to have significant impact on the speed of rehabilitation process. This project (StrokeBack) also is recently funded by EU FP7 programme. The main aim is on-body computation of movement parameters accurately and generating automated feedback to the Physiothrapists and Patients for aiding accurate execution of rehabilitation exercises with minimal supervision. He is also a co-investigator for the EPSRC platform grant on System-on-Chip: Design methods and Tools (SoC), awarded to University of Southampton. Prof. Maharatna has been a member of a number of prestigious conference programme committees and acted as a session chair in conferences such as IEEE ISCAS 2005, 2007, 2008, VLSI design conference 2006, IEEE SiPS 2012 etc. He is a member of the review committee management under the VLSI track chair for IEEE ISCAS 2007 till date and is a member of IEEE VLSI System Application (VSA) Technical Committee. He is a member of EPRSC College, 2006 till date. He has published over 60 research papers in internationally reputed Journals and Conferences. Acharyya, A., Maharatna, K., Al-Hashimi, B., & Reeve, J. (2011). Co-ordinate Rotation based Low Complexity N-D FastICA Algorithm and Architecture. IEEE Transactions on Signal Processing. Meher, P., Valls, J., Juang, T-B., Sridharan, K., & Maharatna, K. (2009). 50 Years of CORDIC: Algorithms, Architectures, and Applications. IEEE Transactions on Circuits and Systems - I, 56(9), 1893-1907. Acharyya, A., Maharatna, K., Al-Hashimi, B., & Gunn, S. (2009). Memory Reduction Methodology for Distributed-Arithmetic-Based DWT/IDWT Exploiting Data Symmetry. IEEE Transactions on Circuits and Systems II: Express Briefs, 56(4), 285-289. Troya, A., Maharatna, K., Krstic, M., Grass, E., Jagdhold, U., & Kraemer, R. (2007). Efficient inner-receiver design for OFDM-based WLAN systems: Algorithm and architecture. IEEE Transactions on Wireless Communications, 6(4), 1374-1385. Maharatna, K., Banerjee, S., Grass, E., Krstic, M., & Troya, A. (2005). Modified virtually scaling free adaptive CORDIC rotator algorithm and architecture. IEEE Transactions on Circuits and Ssystems for Video Technology, 15(11), 1463-1474. Maharatna, K., Grass, E., & Jagdhold, U. (2004). A 64-point Fourier transform chip for high-speed wireless LAN application using OFDM. IEEE Journal of Solid-State Circuit, 39(3), 484-493. Krstic, M., Maharatna, K., Troya, A., Grass, E., & Jagdhold, U. (2004). Baseband processor for IEEE 802.11a standard with embedded BIST. Facta Universitatis, 17, 231-239. Maharatna, K., Troya, A., Banerjee, S., & Grass, E. (2004). New virtually scaling free adaptive CORDIC rotator. IEE Proceedings on Computers and Digital Techniques, 151(6), 448-456. Maharatna, K., & Banerjee, S. (2001). A VLSI Array Architecture for Hough Transform. Pattern Recognition, 34, 1503-1512. Maharatna, K., Dhar, A. S., & Banerjee, S. (2001). A VLSI Array Architecture for Realization of DFT, DHT, DCT and DST. Journal of Signal Processing, 81, 1813-1822. Grass, E., Tittelbach, K., Jagdhold, U., Troya, A., Lippert, G., Krueger, O., ... Maehoenen, P. (2001). On the Single Chip Implementation of a Hiperlan/2 and IEEE802.11a Capable Modem. IEEE Personal Communication, 8(6), 48-57. Mazomenos, E., Cranny, A., Biswas, D., Harris, N., & Maharatna, K. (2014). An investigation into the accuracy of calculating upper body joint angles using MARG sensors. Poster session presented at Eurosensors 2014, Italy. Biswas, D., Cranny, A., Maharatna, K., Achner, J., Klemke, J., Jöbges, M., & Ortmann, S. (2014). Movement fluidity of the impaired arm during stroke rehabilitation. Poster session presented at IEEE Conference on Biomedical & Health Informatics (BHI), 2014, Spain. Panagiotou, C., Dima, S-M., Mazomenos, E. B., Rosengarten, J., Maharatna, K., Gialelis, J., & Morgan, J. M. (2013). Detection of myocardial scar from the VCG using a supervised learning approach. 35th Annual International Conference of the IEEE Engineering in Medicine and Biology Society (EMBC’13), Japan. Biswas, D., Mazomenos, E. B., & Maharatna, K. (2012). ECG compression for remote healthcare systems using selective thresholding based on energy compaction. Paper presented at 2012 International Symposium on Signals, Systems, and Electronics (ISSSE), Germany. Mazomenos, E., Acharyya, A., & Maharatna, K. (2011). Clinical Feature Extraction for Mobile ECG. 8th International Conference on Wearable Micro and Nano Technologies for Personalised Health (pHealth 2011), France. Acharyya, A., Maharatna, K., Al-Hashimi, B., & Tudugalle, H. (2011). Simplified Logic Design Methodology for Fuzzy Membership Function based Robust Detection of Maternal Modulus Maxima Location : a Low Complexity Fetal ECG Extraction Architecture for Mobile Health Monitoring Systems. IEEE International Symposium on Circuits and Systems, Brazil. De Jager, D., Mazomenos, E., Banerjee, A., Maharatna, K., & Reeve, J. (2010). A Low-Power Simplified-MEWS Scoring device for Patient Monitoring. Poster session presented at 4th International ICST Conference on Pervasive Computing Technologies for Healthcare 2010, Germany. Acharyya, A., Mondal, S., Maharatna, K., & Al-Hashimi, B. (2010). Automated and Robust Channel Identification Algorithm and Architecture to Solve Permutation Problem of ICA for Artifacts Removal from ECG in Remote Health Monitoring Environment. Sixth UK Embedded Forum, United Kingdom. Acharyya, A., Tudugalle, H., Maharatna, K., Al-Hashimi, B., & Gunn, S. (2010). VLSI architecture for fetal ECG extraction for personalized healthcare application within resource constrained environmentT. Sixth UK Embedded Forum, United Kingdom. Maharatna, K., Ahmadi, A., & Magieri, E. (2009). Biologically inspired analogue signal processing: some results towards developing next generation signal analyzers. In Proceedings of the 2009 12th International Symposium on Integrated Circuits (pp. 542-5). IEEE. Maharatna, K., Ahmadi, A., & Mangieri, E. (2009). Biologically inspired analogue signal processing: some results towards developing next generation signal analysers. Paper presented at International Symposium on Integrated Circuits (ISIC2009), Singapore. Shahidipour, H., Ahmadi, A., & Maharatna, K. (2009). Effect of Variability in SWCNT-Based Logic Gates. International Symposium on Integrated Circuits (ISIC2009), Singapore. Acharyya, A., Maharatna, K., Sun, J., Al-Hashimi, B., & Gunn, S. (2009). Hardware Efficient Fixed-Point VLSI Architecture for 2D Kurtotic FastICA. 165-168. 19th European Conference on Circuit Theory and Design, Turkey. Acharyya, A., Maharatna, K., & Al-Hashimi, B. (2009). Hardware reduction methodology for 2-dimensional Kurtotic Fast ICA based on algorithmic analysis and architectural symmetry. Poster session presented at IEEE Workshop on Signal Processing Systems, Finland. Ahmadi, A., Mangieri, E., Maharatna, K., & Zwolinski, M. (2009). Physical Realizable Circuit Structure For Adaptive Frequency Hopf Oscillator. Paper presented at NEWCAS-TAISA'09, France. El Shabrawy, K., Maharatna, K., Bagnall, D., & Al-Hashimi, B. (2008). A new analytical model for predicting SWCNT band-gap from geometric properties. 211-214. International Conference on IC design and technology (ICICDT 2008), France. Mangieri, E., Ahmadi, A., Maharatna, K., Ahmad, S., & Chappell, P. (2008). A novel analogue circuit for controlling prosthetic hands. 81-84. IEEE Biomedical Circuits and Systems Conference, United States. Acharyya, A., Maharatna, K., & M. Al Hashimi, B. (2008). Hardware Development for Pervasive Healthcare Systems: Current Status and Future Directions. 1304-1307. 2008 IEEE Asia Pacific Conference on Circuits and Systems, China. Maharatna, K., El Shabrawy, K., & Al-Hashimi, B. (2008). Reduced Z-datapath CORDIC rotator. 3374-3377. Poster session presented at IEEE ISCAS, United States. Ramakrishnan, H., Chattopadhyay, S., Maharatna, K., Shedable, S., & Yakovlev, A. (2007). Exploration of potential of strained-Si CMOS for ultra low-power circuit design. Paper presented at 8th International Conference on Ultimate Integration on Silicon, . Ramkrishnan, H., Maharatna, K., Chattopadhyay, S., Yakovlev, A., & O'Neill, A. (2007). Impact of strain on the design of low-power high-speed circuits. Paper presented at IEEE International Symposium on Circuits and Systems, . Stapenhurst, R., Maharatna, K., Matthew, J., Nunez-Yanez, J., & Pradhan, D. (2007). On the hardware reduction of z-datapath of vectoring CORDIC. IEEE International Sympsium on Circuits and Systems (ISCAS) 2007, . Maharatna, K. (2006). A low-power 128-pt FFT for wireless personal area network. 11-14. Paper presented at International Conference on Electronic and Photonic Materials, Devices and Systems (EPMDS) 2006, India. Leeke, S., & Maharatna, K. (2006). A low-power geometric mapping co-processor for high-speed graphics application. 3193-3196. Paper presented at IEEE International Symposium on Circuits and Systems (ISCAS) 2006, Greece. Garrido, J-S., Piachocki, R., Maharatna, K., & McNamara, D. (2006). Analogue MIMO detection on the basis of belief propagation. Paper presented at IEEE Mid-West Symposium on Circuits and Systems (MWSCAS) 2006, . Matthew, J., Maharatna, K., & Pradhan, D. (2006). Exploration of Power Optimal Implementation Technique of 128-Pt FFT/IFFT for WPAN using Pseudo-Parallel Datapath Structure. Paper presented at 10th IEEE International Conference on Communication Systems (ICCS) 2006, Singapore. Garrido, J-S., Piachocki, R., Maharatna, K., & McNamara, D. (2006). MIMO detection in analogue VLSI. 4895-4898. Paper presented at IEEE International Symposium on Circuits and Systems (ISCAS) 2006, Greece. Maharatna, K., Troya, A., Kristic, M., & Grass, E. (2006). On the Implementation of a Low-Power IEEE 802.11a Compliant Viterbi Decoder. Paper presented at 19th VLSI Design Conference 2006, India. Huggett, C., Maharatna, K., & Paul, K. (2005). On the implementation of 128-pt FFT/IFFT for high-performance WPAN. 5513-5516. Paper presented at IEEE International Symposium on Circuits and Systems (ISCAS) 2005, Japan. Maharatna, K., Troya, A., Banerjee, S., Grass, E., & Krstic, M. (2004). A 16-bit CORDIC rotator for high-performance wireless LAN. Paper presented at IEEE Personal Indoor and Mobile Radio Communication (PIMRC) 2004, Spain. Maharatna, K., Troya, A., Krstic, M., Grass, E., & Jagdhold, U. (2004). A CORDIC like processor for computation of arctangent and absolute magnitude of a vector. II-713-716. Paper presented at IEEE International Symposium on Circuits and Systems (ISCAS) 2004, Canada. Maharatna, K., Grass, E., & Jagdhold, U. (2003). A novel 64-point FFT/IFFT processor for IEEE 802.11(a) standard. 321-324. Paper presented at IEEE International Conference in Acoustic, Speech and Signal Processing (ICASSP) 2003, . Krstic, M., Troya, A., Maharatna, K., Grass, E., & Jagdhold, U. (2003). Implementation of an IEEE 802.11a compliant low-power baseband processor. 97-100. Paper presented at IEEE International Conference on Telecommunications in Modern Satellite, Cable and Broadcasting Service (TELSIKS) 2003, . Krstic, M., Troya, A., Maharatna, K., & Grass, E. (2003). Optimized low-power synchronizer design for the IEEE 802.11(a) standard. 333-336. Paper presented at IEEE International Conference on Acoustic, Speech and Signal Processing (ICASSP) 2003, . Troya, A., Krstic, M., & Maharatna, K. (2003). Simplified residual phase correction mechanism for the IEEE 802.11a standard. Paper presented at IEEE Vehicular Technology Conference (Fall) 2003, . Sarker, B., Grass, E., & Maharatna, K. (2002). Asynchronous CORDIC processor implementation. Paper presented at 2nd Asynchronous Circuit Design Workshop (AciD) 2002, . Grass, E., Sarker, B., & Maharatna, K. (2002). Dual Mode Synchronous/Asynchronous CORDIC Processor. 76-83. Paper presented at 8th IEEE International Symposium on Asynchronous Circuits and Systems (ASYNC) 2002, United Kingdom. Troya, A., Maharatna, K., Krstic, M., Grass, E., & Kraemer, R. (2002). OFDM synchronizer implementation for an IEEE 802.11(a) compliant modem. 152-157. Paper presented at IASTED International Conference on Wireless and Optical Communication, 2002, Canada. Maharatna, K., Grass, E., & Jagdhold, U. (2000). A Low-Power 64-point FFT/IFFT Architecture for Wireless Broadband Communication. 36-1-36-3. Paper presented at 5th International OFDM Workshop 2000, Germany. Maharatna, K., Grass, E., & Jagdhold, U. (2000). A Low-Power 64-point FFT/IFFT Architecture for Wireless Broadband Communication. 2A-2-1-2A-2-4. Paper presented at 7th Int’l Conference on Mobile Multimedia Communication (MoMuC) 2000, Japan. Maharatna, K., & Banerjee, S. (2000). CORDIC Based Array Architecture for Affine Transformation of Images. 645-648. Paper presented at Int’l Conference on Communications, Computers and Devices (ICCD) 2000, India. Maharatna, K., & Banerjee, S. (1999). Low Power CORDIC Processor Design Using Transmission Gate Logic on Sea of Gates. Paper presented at Int’l Conference on Modeling Simulation and Communication (CMSC) 1999, India. Maharatna, K., & Banerjee, S. (1998). Low Voltage/Low Power CORDIC based DHT chip implemented using Transmission Gate Logic on Sea of Gates. 154-157. Paper presented at Int’l Conference on Computers and Devices for Communication (CODEC) 1998, India.